There isn’t much that chills us to the bone more than thinking about going through the ice. Like anything, it is better to be prepared for when the time comes. Knowing how to handle yourself when exposed to the frigid water can make the difference between life and death. Here is a video of what to do if you go through the ice. It is a good idea to check other videos though because there are several techniques that can be utilized. In the last two years, I have gotten wet twice but fortunately, never over my waist. The first time, I was helping someone move their shanty after some people had punched numerous big holes all around it. They were punching groups of holes that were 4 x 2 as the ice was fading towards spring. After successfully moving the shanty, I was walking to shore and stumbled into a hole that was completely concealed by snow. Luckily, the water was less than two feet deep and I was already packed up to head home. Sure made for a long hour ride home though! The second time through was my last trip out this past season. I was stepping over open water from ice to the shore and I short stepped it a bit after underestimating the depth at shore. I only went up to my knee because I caught myself on a tree on shore but I spent the next six hours fishing with a wet leg. Even using every safety measure possible there is no guarantee that you will stay dry. There are a few things an ice fisherman can do to help ease their mind in preparation for an ice outing. There are a number of low profile Personal Floatation life vests on the market today. It’s not a bad idea to wear one on the first ice of the year and the last. Of course the most important thing to remember during these periods is to never fish a lone. Let your family and friends know where you’ll be for the day and when you’re expected to be home. I usually like to keep a dry set of clothes in my vehicle just in case I do get wet, I’ll have something to change into. A second piece of safety equipment that I always have on hand are ice picks. I wear them around my neck, tucked into my bibs so that they are always accessible. Early and late season, I also like to carry a long section of rope to throw in case of emergency. Both of these items are inexpensive and don’t take up much room. 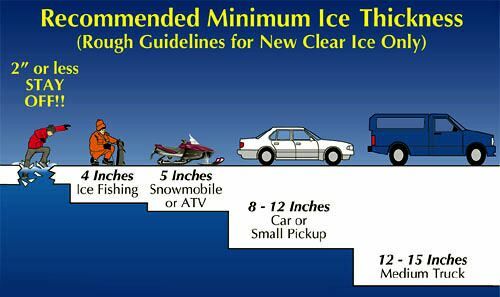 Here is a chart that is a good general guide on the strength of of specific ice thicknesses. Keep in mind that ice quality and thickness is not always consistent. Check as you go and stay dry!